Homemade mill vise soft jaws fabricated from 6061 aluminum and intended to fit an Enco vise. 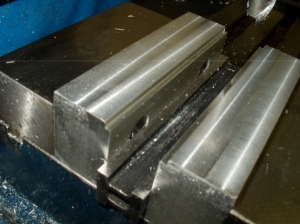 Profiles are cut into the jaws to accommodate round, square, and oddly-shaped objects. Other jaw profiles provide hold-down capabilities.